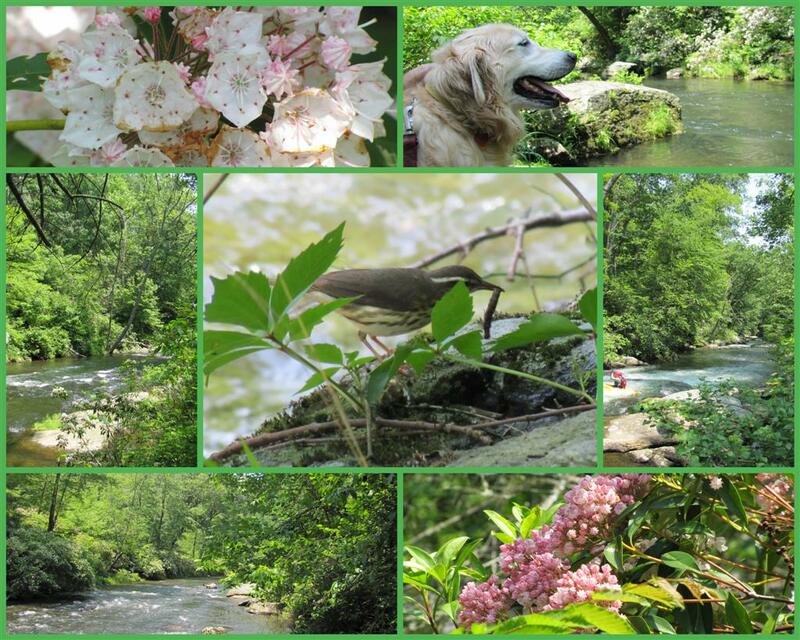 This week hubby and I hiked down the trail to the Gunpowder River to see the mountain laurels in bloom. The trail along the river has an amazing amount of white and pink mountain laurels blooming. The weather was great for hiking and we sat and watched some kayakers playing around in the white water area of the river. It is also a river popular with the trout fishermen and people tubing. I was also able to check out the birds along the river. I saw a beautiful Scarlet Tanager high in the tree tops. Acadian Flycatchers were all around and I am pretty sure I heard a Prothonotary Warbler. One of the birds that popped up close to me was the Louisiana Waterthrush. This bird likes to nest in woodlands near rivers or fast moving streams. As you can see it has pinkish legs and a wide white supercilium. Which to me looks just like an eyebrow. Goldie Girl got to play in the river and cool off. The mountain laurel was blooming beautifully, I really loved the pink ones. To see more great photos and mosaics please visit Mary's Mosaic Monday and That's My World thanks to Mary of Little Red House and to the group of hosts at That's My World : Sylvia, Wren, Sandy and Klaus. Also thanks for visiting my post and I wish everyone a great week. you have so many good places to visit. I bet you never get bored. It is so rich in flora and fauna. And birds of course. I love that little water trush. Hi Eileen, Very pretty scenic and refreshing! Glad your dog enjoyed the jaunt as much as you did! Have a super nice evening and a great coming week! Wonderful photos and mosaic. Your Mountain laurel is very beautiful. And your Goldie Girl too. Your dog's face is so cute...you could just tell that he was having a great time! Beautiful pictures. Beautiful, Eileen, just beautiful. (Do you ever stay at home?!!!!!) Thanks for sharing your adventures! Such a beautiful flower and since my daughter shares their name, I had to enlarge all the photos for a closer look. What a sweet little bird with the lovely white eyebrow, too. I don't think we have them in my corner. I'm sure I'd have noticed. Hope that you have many happy hikes this summer! Does Goldie girl go in the water when it is cold? 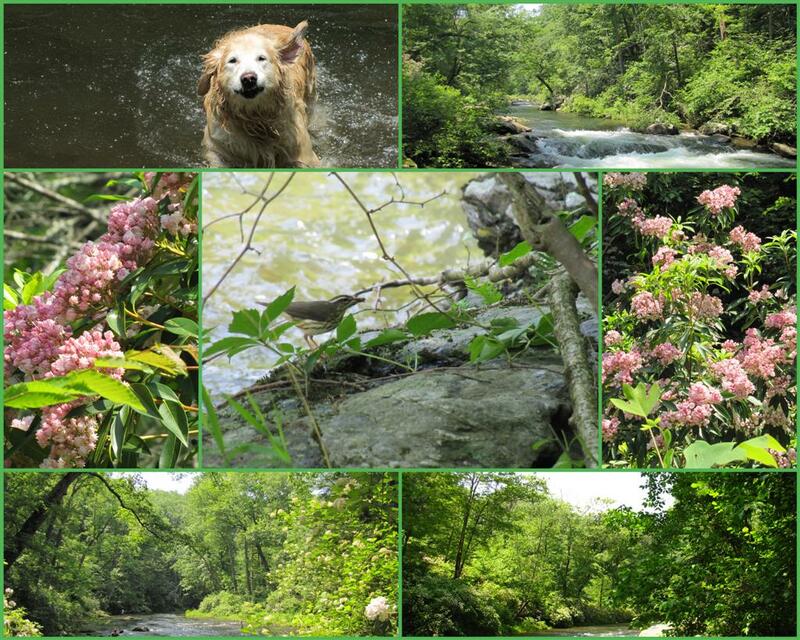 A wonderful photo tour of your hike along the Gunpowder River. Beautiful photos, lovely, beautiful color and excellent sharpness. What a fabulous place for a hike. The blooms are beautiful an so too the birds. Goldie is sure having fun. wonderful photos, nice hiking place and beautiful mosaic. The water looks so refreshing! Our mountain laurels are in bloom too. Oh wow! Just blows me away..how could you leave? lol! I love that thrush, what a beautiful bird and I love the white eyebrow! Great, great post and thank you for sharing! Beautiful photos and mosaics. And I just love all the pictures of Goldie! She looks like she is one happy dog! Thanks for sharing such a pretty place with us. Looks like your dog enjoyed it also. Beautiful photos! I reallt liked the waterfall and your lovely dog! Great hike and the flowers are beautiful!! Boom & Gary of the Vermilon River, Canada. What a gorgeous place! And I do love your photos, Eileen, they are really superb! Love the pictures of Goldie and she does seem to be having a great time, too! Thanks for sharing the beauty and the fun!! Have a great week! You must be living close to paradise indeed. What a glorious place you have captured. Your photos show the magic of nature perfectly. And the happy pet knows how to soak it all up! I love the Mountain Laurel. It is not here in our part of Ky. but east in the Appalachians. That was a unique shot of the bird with the worm. Great job. This is so lovely. I am hosting a photobook giveaway on my blog. Would love for you to stop by. All those wonderful photos of birds and blooms and I'm afraid Goldie Girl stole the show! Beautiful shots of the place, very scenic. Looks like Goldie Girl had real fun. Your Goldie Girl seems to be having so much fun in the water. We haven't had enough warm weather (and certainly no hot weather) to worry about cooling off, but we did get our golden girl Lindy her summer haircut today because she was getting pretty raggedy. Your photos are beautiful. I love rivers, and your mountain laurel is lovely. Beautiful pics, love the arrangement in the collage. The shot of your beautiful Golden just says 'summer' to me. Such a lovely series of photographs. The wildflowers are fantastic. Looks like a wonderful hike. I also love mountain laurel. Your dog is a beauty. The header shows me such a beautiful river. Wow, breathtaking photos! Where is this river? It is gorgeous. Love the laurels, but oh how cute is Goldie? You got great shots of the birds too. Thanks so much for visiting my blog. I really appreciate it! What a beautiful place. I really enjoyed seeing the mountain laurel, we don't have them in this area. I can't imagine ever wanting to move away from that beautiful area Eileen. Are there any downsides to living in Paradise ;>)... I don't think I've ever seen Mt Laurel -- it is just beautiful -- as are all your birds as always. Goldie Girl looks like she is having the time of her life!!! !